If you use forklifts at your business, providing forklift safety training and certification for your drivers isn’t just a good idea … it’s the law. 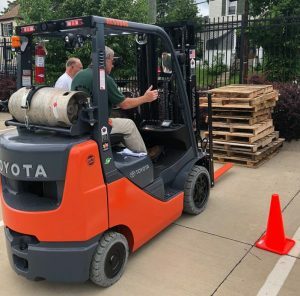 The US Occupational Safety and Health Administration requires employers to provide training, testing, and certification for anybody operating a forklift within a business. It doesn’t matter if the business owns the forklift or leases the vehicle or if the employee is full-time, part-time, or seasonal. If an operator is behind the wheel, they need to be certified. And the business needs to be able to prove it. Now, OSHA inspectors aren’t likely to show up unexpectedly at your business to check for driver certification — although Canadian businesses recently were subjected to surprise inspections by that country’s workplace safety agency. But if there is a workplace accident resulting in a serious injury or fatality at your business, you can be sure OSHA will show up demanding the required documentation, not only for the operator involved but for every forklift driver working there. When it comes to providing forklift training, testing, and certification, businesses have a number of options. They can 1.) Perform the training in-house, 2.) Use one of the many online training or video training services, or 3.) Hire an outside agency to provide employee training either on-site or at an outside training facility. Federal regulations don’t mandate one type of forklift safety training over another. OSHA only stipulates that the training, testing, and certification be performed by somebody who has the “knowledge, training, and experience”. If somebody within your organization fits that description, then he or she may provide the training — as long as they are familiar with what needs to be covered, how to properly test for retention and practical skills, and how to create, issue, and store the required documentation. People who are knowledgeable about forklift operations but inexperienced at the other requirements may create liability for your business if you let them train other employees. So another option is to use professionally produced training materials, many of which come with testing modules and certification documents. Packaged training courses offer an affordable option while improving the business’s liability risk. They also have the benefit of being used for multiple employees with no additional cost. There are companies that specialize in providing personalized forklift safety training for operators. Some will come to your business and perform the training right on your property. Others require that your drivers travel to their training facility for instruction and testing. The benefit of these services is that they provide comprehensive training by skilled, experienced teachers. The downside, however, is that they tend to be very costly. If you have more than one operator, these training costs can add up very quickly. Regardless of the type of forklift training and certification you provide, it’s important that companies are able to prove that the training took place. Plus, the more your drivers know about forklift safety, the fewer accidents there are likely to be on your property, protecting products and property and reducing the risk of injuries or even death.